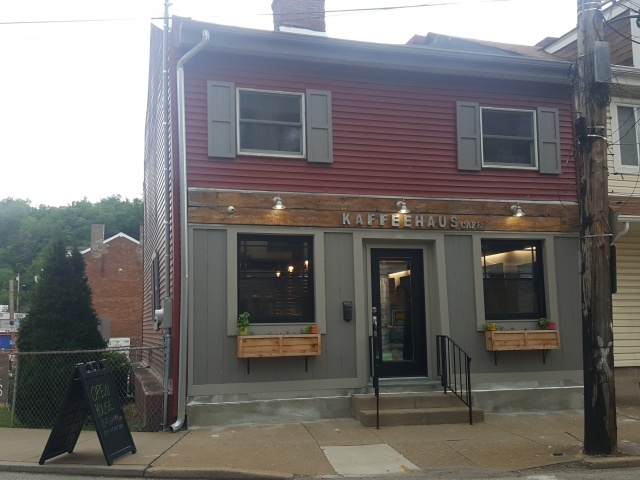 Situated at the corner of Chestnut Street and Spring Garden Avenue, Kaffeehaus is bringing new energy to the Northside with a variety of coffees, teas, gourmet pastries and lunch items. Open for business in June of 2017, Kaffeehaus hopes to contribute to the revitalization of the area. Earning a Silver designation with the Sustainable Pittsburgh Restaurant program, Kaffeehaus is committed to supporting a healthier, happier, and more prosperous city. Owners, Tammy and Chris Waraks feel a strong responsibility to encourage rehabilitation of the neighborhood since they are residents of Pittsburgh themselves. They have a mission to provide a space to bring the community together and serve healthy, fresh foods accompanied by great coffee and tea. They offer espresso-based drinks, both hot and iced coffees, and some of the best nitro coffee in the city. Tammy’s food menu is a balanced mix of baked goods, sweets, and lunch items making this the perfect spot to grab a quick bite to eat and mingle with the locals. The Sustainable Pittsburgh Restaurant program recognizes restaurants that build vibrant communities and a healthy environment. Kaffeehaus exemplifies the mission of the program by incorporating sustainable practices into their day to day operations. By recycling, composting, and using environmentally friendly cleaning products, Kaffeehaus is doing their part to minimize their impact on the environment. The café sources a lot of their goods locally from Commonplace Coffee, Turner’s Dairy, and Cellone’s Italian Bread Company to name a few. In fact, many of the ingredients they source are certified organic! In an effort to use existing materials instead of buying new, much of the furniture and fixtures in the café are upcycled and repurposed which drastically reduced their renovation waste. They also do their best to conserve energy by turning off equipment and lights when not in use. To learn more about Kaffeehaus’ sustainability efforts, you can view their profile and read their complete designation report. Interested in visiting Kaffeehaus in the up and coming Northside neighborhood? Head over to 1022 Chestnut Street, open Tuesday through Friday from 6:30am to 2:30pm, and Saturday from 8am to 2pm.